Produce for Kids’ marketing programs take place in grocery stores across the country promoting healthy eating and benefiting local children’s non-profit groups. These campaigns combine advertising, in-store displays and events, public relations and Internet marketing. Ideal Meals™ offer simple, healthy meal solutions for busy parents through complete meal recipe ideas created by a chef and approved by a nutritionist. Since its creation in 2002 by Shuman Produce Inc., Produce for Kids has raised more than $3.7 million for children’s non-profit organizations including Children’s Miracle Network® Hospitals, Let’s Move Salad Bars To Schools and PBS KIDS® among others. All funds raised directly benefit these partner organizations. 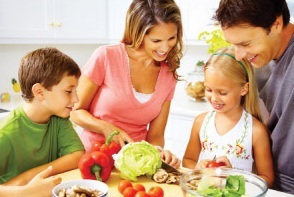 Year-round resources for parents include Ideal Meals; the Parents on Produce board, a panel made up of busy working parents; Ideal Meal demonstration videos and healthy eating tips and articles. The Produce for Kids program has been embraced by the produce industry and covers grocery store retailers in more than 40 states and incorporates suppliers in every major produce category. The reason I am introducing you to Produce For Kids is because they are launching their annual Get Healthy, Give Hope campaign now through July 28th. Here are the details! Produce for Kids® has launched its annual Get Healthy, Give Hope campaign with 16 major supermarket chains across the country, including your local Price Chopperstores, to help raise money for local children’s hospitals. Now through July 28th, thanks to the annual Get Healthy, Give Hope campaign hosted by Price Chopper andProduce for Kids, the more produce shoppers add to their shopping lists the more hope they can give to local children. Celebrating a milestone 10th birthday in 2012, Produce for Kids is excited to kick off this year’s campaign with a new partnership with Sprout® and LazyTownTM. During the campaign, Produce for Kids will offer shoppers collectible Ideal MealsTM – quick and easy healthy meal ideas, which are free and can be found in displays featuring LazyTown characters from the popular, health-focused, children’s series airing exclusively in the U.S. on 24-hour preschool television channel, Sprout. In conjunction with this campaign, I was sent a few recipes to share with you all that are sure to get your children's taste buds perked in the healthier direction! So, there is just a taste (no pun intended!) of some of the recipes that you will find on Produce For Kid's website. Don't they look soo yummy? I am excited to try those out with my children...I know they will love them! Here is a listing of events that will be taking place so check to see if any of them are near you! As a thank you for taking the time to check out this Get Healthy, Give Hope campaign from Produce for Kids, you will have an opportunity to win a $25 gift card to Price Chopper stores! Please be sure you have a location near you prior to entering. Disclaimer: I received no monetary compensation for this post. I will be receiving free product in exchange for my post. All quotes and stock photos are from the Produce For Kids website and email. Prize is being provided and shipped by the sponsor. All thoughts and opinions are 100% mine. Teriyaki Steak & Veggies sounds great! I like the turkey burger and rainbow salad. I'm entering on the rafflecopter as Mary Happymommy. I learned less than 1/3 us kids k-12 get proper nutrition. The recipe for Caramel Maple Yogurt Dip looks amazing (and easy!). I would love to try the recipe for the Southwest Chicken Wraps. Thanks. The Orange Salsa Tilapia sounds yummy. The pineapple pork kebabs sound yummy. i read Top 10 Ways to Get Your Kids to Try New Foods because my son is very picky and reluctant to try new foods. Keep the food light. Instead of relying on fast food, offer healthy alternatives. Finger sandwiches are great for kids of all ages. Make some pin-wheel sandwiches with your favorite combinations like ham and cheese, turkey and tomato and chicken - all packed with veggies, of course! Try the Tasty Hummus Sandwich, PB Fruit Roll-up or Chicken Veggie Wraps Ideal Meals for some healthy, kid-friendly ideas. Involve them in the raising of the food. Most of us don’t have room to raise cows or pigs, but we can put a pot of herbs on a sunny windowsill or a tomato plant on a balcony. It’s satisfying to eat what we’ve watched and help grow. I wanna try the Teriyaki Steak and Veggies. I want to try the Roasted Vegetable Chicken Soup. I would love to try the Healthy Hearty Beef Stew! Yum! They have lots of good recipes and good tips on how to get children to eat healthy. The Teriyaki Steak & Veggies, sound really good. Thanks for this contest! The Holiday Breakfast Wrap sounds delish!